I’ve been a bad blogger lately, but rest assured I’ve been a busy bee painting up a storm, much to the chagrin of the boyfriend who would like to use my our studio/office/bedroom to sleep, of all things. I’ve mostly been painting stuff for family Christmas gifts, so I’ve been a little hesitant to post pics and ruin the surprise. But after an impromptu airport layover visit with my sister and her hubby tonight, they fly off to Mexico and my parents are already in Hawaii, so the coast will be clear! 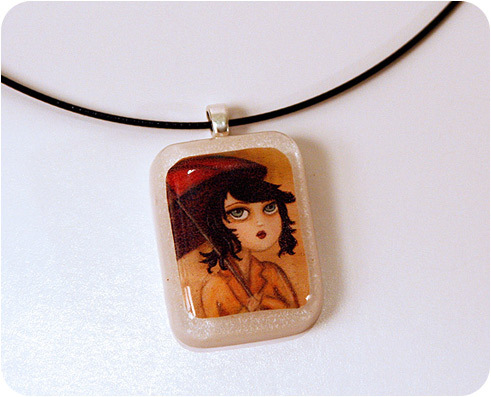 In the meantime, take a gander at the sweet little Umbrella Girl pendant I just listed in the shop. Love this one!